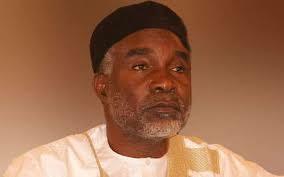 Former governor of Adamawa state, Vice Admiral Murtala Nyako (retd), has alleged that some political leaders seem to be drunk with local rum, better known as ‘ogogoro’, before speaking on public matters. According to him, the quality of remarks made on some important national issues does not reflect reasonable sense. Nyako also described the controversial tenure elongation for the party’s national chairman, John Odigie-Oyegun and other states executives, as death sentence for the party if urgent action is not taken to address the illegalities and impunities going on in the party. He spoke in Yola, yesterday, while addressing hundreds of APC supporters at his residence. The former governor said APC has lost moral grounds to speak on due process, rule of law, enforcement of democratic norms and culture. He contended that the only way out of the controversies surrounding the tenure elongation is for a convention to be organised. Nyako said anything outside this would not work. According to him, the actions of those who feel the party is their private estate will not make APC move forward. “Even if a mechanic takes APC to court today over the unconstitutional and undemocratic tenure extension of party officials, it is very clear that the court can lock the national secretariat of the party. If there is no convention in APC before the general elections, the party may become a spectator instead of a participant,” he warned. While emphasising that only fairness, legality, justice and the rule of law can sustain the APC ahead of the 2019 general elections, Nyako urged his party to learn from what led to the defeat of the Peoples Democratic Party (PDP) during the 2015 general elections and retrace its steps before it is too late.